Is the baby suffering from cradle cap? Red, itchy, and flaky scalp can make babies fussy and irritated. To protect their sensitive scalp, make sure to use only the best hair care products. 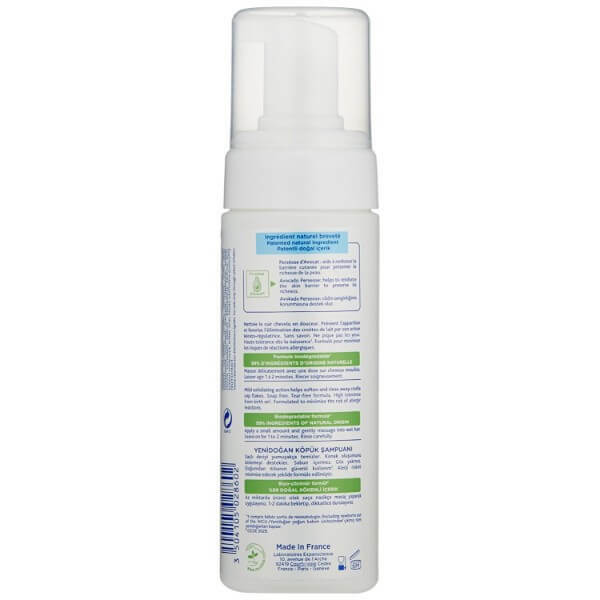 Mustela Foam Shampoo for Newborns is perfect for cleansing and keeping scalp fresh. It has an ultra-gentle formula perfect for newborns. Cradle cap is the most common scalp condition babies suffer from. A baby’s scalp is very sensitive and may suffer from irritation when you use harsh bath and body products. It is important to choose a formula that cleanses the scalp well without causing allergic reactions. 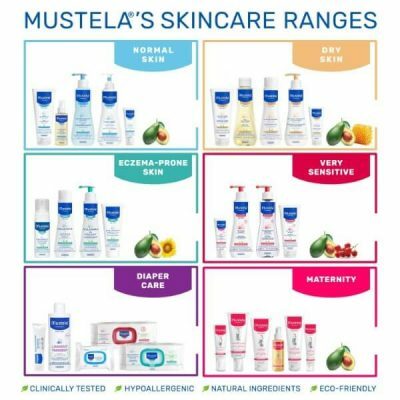 Mustela Foam Shampoo for Newborns is the perfect solution. 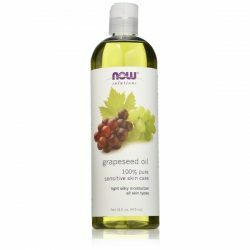 This tear-free shampoo contains natural ingredients that help cleanse scalp and treat cradle cap. 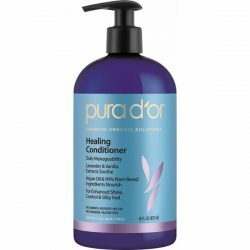 The shampoo is hypoallergenic as well to prevent scalp conditions from happening. Mustela’s gentle shampoo for babies contains avocado perseose. This active ingredient works perfectly to protect the scalp from damage. Avocado perseose helps in the development of a baby’s skin barrier. Newborns have a delicate skin that is very sensitive to the environment. It takes years to fully develop the barrier of the skin including the scalp. Avocado perseose helps protect the skin of newborns. 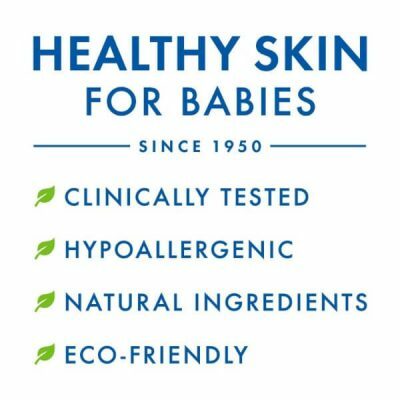 As a plant-based ingredient, it is safe to apply to skin. It contains Climbazole as well. This ingredient prevents cradle cap. 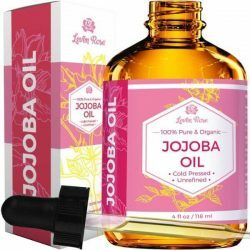 It keeps scalp free from dandruff and eczema too. 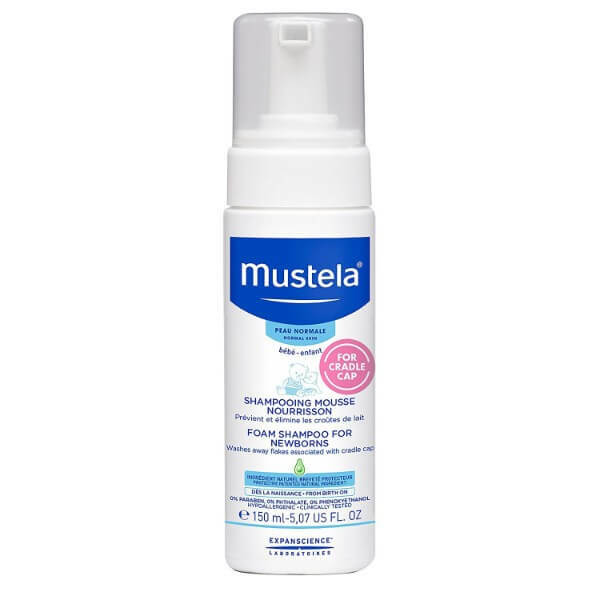 Mustela Foam Shampoo for Newborns comes in a light foamy texture that smooths over scalp well. The shampoo helps reduce the risks of developing new scalp conditions. It prevents allergic reactions as well. Tear-free formulas keep babies calm and happy during baths. Try it to enjoy a fun bath time with your baby! It comes with a dispenser nozzle for easier usage. Just wet hair, apply the shampoo and rinse with lukewarm water. Make sure it does not come into contact with eyes. Use this daily to get rid of the flaky scalp in no time! Wet hair and scalp. Dispense enough amount of the shampoo to cover a baby’s entire scalp. Smooth over scalp and massage for a few minutes. Rinse using lukewarm water. Use daily for best results.